Relatively Retiring: Heaps of Passion. It's been a long, hard, dark, cold winter here in Middle England. It's felt sterile and unproductive, with frozen ground and frozen air, and the sort of North winds that cut through all the layers of clothing. Suddenly, last weekend, there was power in the sunlight. I sat in the summer-house, although it was hardly summer. The sap was visibly rising, the vine dripping where it had been pruned last autumn; daffodils, snowdrops, crocus, pulmonaria, hellebore stretching out to greet the warmth. Just as the dog and I were doing. I needed to get soil beneath my finger-nails again, and so did the dog. She began digging, too, in her secret location behind the dustbin. Knowing it to be illicit, or at least generally disapproved of, she was at it furtively, with many backward glances in my direction. I could be more positive. I got out the mower and cut the grass. Then I became thoroughly motivated. Grass cuttings! My compost heap could grow again. One thing that stirs deep passions in my admittedly matronly bosom is my compost heap. Well, both compost heaps, for one is a work in progress, maturing, while the other is being built. 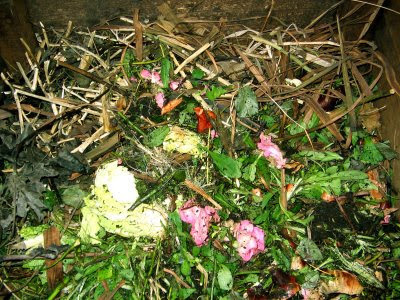 A glance at the contents of my compost-in-progress will show you that hardly anything is wasted in this small plot. All the vegetable parings, garden refuse, dead house-plants and floral arrangements are chopped and added, and now they can be layered with grass-cuttings. Within a few months they will be reduced and reformed to the consistency of something more appetising and much healthier than chocolate fudge cake. This rich, dark, crumbly goodness is then fed back. The bamboos will be enjoying the remains of my birthday bouquet, the day-lilies will thrive on vegetable peel. To anyone who doesn't garden it is really hard to convey this sort of passion. To anyone who does...well, it's familiar territory. The satisfaction to be gained from recycling the unwanted into something valuable is immense, and seems to grow with age. In widowhood I have had to learn to garden in a different way. I have had to find ways of doing heavy tasks, like compost-turning, branch-cutting, heavy pruning, patio-grouting. The secret seems to be to take it slowly; to break really hard tasks into smaller units, and to know when to stop, which is at the point when the pain begins, rather than wait until it becomes really bad. This now seems to be a good way to approach life in older age; to recognise the limits and to accept them, while at the same time trying to find a way around them. It encourages lateral thinking skills. Slow maturing, just like the compost heap. Labels: compost, gardening, recycling, widowhood. I think it's a good approach to much of life... break it into smaller bits are do the best you can! I am lucky enough to have a young woman come round every week who can do the more difficult tasks for me. But when she is not there, and I am too impatient to wait, I resort to a variety of ways of 'breaking into smaller parts'. I sit on a chair to lift heavy objects from the floor to a higher level, from where I can move them more easily, or to put stores away on low shelves, so I don't have to remain bending while I do it. And I carry things up and down stairs in a large bag if they are bulky, as I often need both hands on the handrails. Mind you, I am a bit more advanced in age than you are I think. Composting is very good and satisfying. We don't have room here - it is a very tiny garden. Watching bulbs grow and plants sprout is always exciting. There is a great freedom in overcoming difficulties of like such as aging, or in realising that not everything needs to be done now, this minute, but can rather be managed, put into future schedules, or, as you say, broken into smaller tasks. It is always so interesting to read your posts. Judith: thank you for your comment. I so admire what you say about yourself on your blog, and I love the idea of leaving a footprint. I look forward to following your writings. Persiflage: thank you, too. I hope we Senior Bloggers have much to give and much to learn....and new challenges to meet all the time! I have never had, and may never have a garden, but in my imagination, I have a huge, warm, metamorphosizing heap, and green shoots just under the surface, waiting to erupt. Zhoen: I love the idea of the compost of the imagination! I'm pretty sure I've got it too; throw in lots of ideas and wait to see what emerges! Word verification can be spooky. I left a silly poem in a comment on PPete's site recently, and the word verification was 'Verses'. Ah, the joy of composting! But I found a Goanna lizard in the middle of one of my compost heaps the other day! I think he was enjoying the heat. Your hound sounds like she enjoys being with you in the garden. HHnB: I've just investigated Goanna lizards......they can eat a SHEEP? You live on such a large scale. I get rats in my compost! Yes, the dog had to learn to enjoy a garden and was reluctant to leave the house when she arrived here. Now she knows exactly where the sunshine might be at any time of the day,and she can almost open the summerhouse by herself. Ah, I, too have been grubbing around in the garden, and very satisfying it is too! I like your description of 'maturing' rather than rotting, it is SO important not become rotten in later life! Mouse: Yes, I hope I found you again. Rotting and maturing - a huge difference, and I try to stay firmly in maturing mode! I get slugs and snails in my compost heaps. I can never decide whether this is good (they're not eating my hostas) or bad (they're getting nice and strong, all ready to make an onslaught on my hostas). Isabelle: you make me realise just how much I miss my hedgehogs, who have not been around for two years now. They cleaned up the whole place of slugs and snails. I used to have magnificent hostas, but no more, alas.